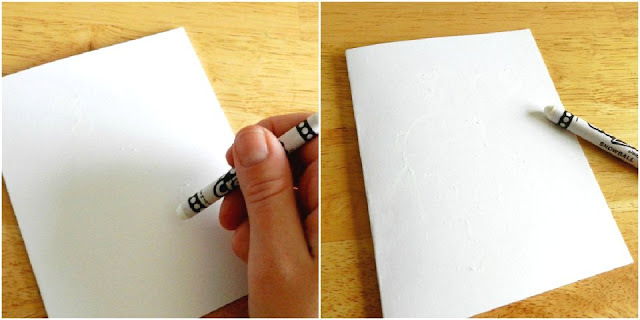 Step 1: Draw a design or write a Valentine's message on the front of a folded piece of white card stock or watercolor paper. This is kinda hard to do because you can't see very well what you are drawing or writing. Step 2: Load up some watercolor paints on a paintbrush and paint over the area you just drew on with with crayon to see your design come to life! Step 3: Let the paint dry and add any other embellishments you like. I love these. I want to learn to do watercolor. OOh they look great! I also remember as a kid colouring a page then painting over it in black paint and scraping back for a great effect. Cool! I made "mystery valentines" like that for Spencer last year. I did the writing and he got to paint them to find the mystery message. He thought it was cool. I love your idea of using them for cards though. My boys would really enjoy doing this! 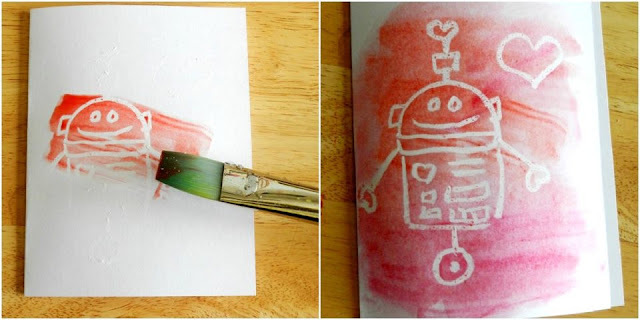 Cute robots- ours would look more like scribbles, but it would be fun nonetheless- thanks for a fun idea! What a fun project for the kids! I'll be pinning this! I LOVE this!! I'll be making these with my kids. Thanks! I love these. Any kid would love painting their own valentines.I featured them on my blog today http://www.missloviecreations.blogspot.com/2013/01/12-sweet-handmade-valentines.html Come on over and check it out and grab a button if you like! I love these! Very adorable! Wonderful tutorial! Such a smart idea! I featured this awesome tutorial on our blog post here - Valentine's Day Crafts. So easy and cute! A sure fun and perfect for kids! Thanks for sharing this great idea! Such a wonderful and clever idea for a Valentines day greetings. I think that'll work best for "secret messages" as well. (I saw it somewhere, when you put colors or scrape of colors, the message will be revealed, or something like that). Nice inspiration!